Heat the oven to 180C/fan160C/gas 4. Cook the onions in a little butter until golden and caramelised, about 10-15 minutes. Fry the leeks in a knob of butter until soft. Season well. Mix the onions, leeks, cheese, spinach and some seasoning in a bowl. Butter a large baking dish, lay 3 sheets filo on the bottom, buttering each layer (trim if you need to). 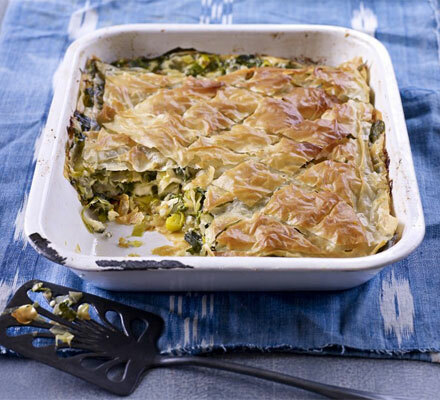 Put 1/3 of the leek mix on top of the filo and add a further 3 layers of pastry. Add another 1/3 of the mixture with 3 more layers of filo, and finally add the last of the mixture and finish with the last 3 layers of the pastry and lots of butter. Score a criss-cross pattern on the top, then bake for about 30-40 minutes until crisp and golden. Cut into big pieces and eat with a simple salad.